Ahhhhhhh, I heart this couple! They are both some of the most creative people I have met. Jonathan is an amazing ink illustrator and Millie creates beautiful content their beautiful tumblr (see it here). Check out their Instagram feed sometime too, it is beautiful (@critcher). Needless to say, before I met them I was kind of nervous. Would I be able to see their vision through? Would I create florals that fit into their style and niche? But I shouldn’t have been nervous. They were so kind hearted and sweet and loved the florals. 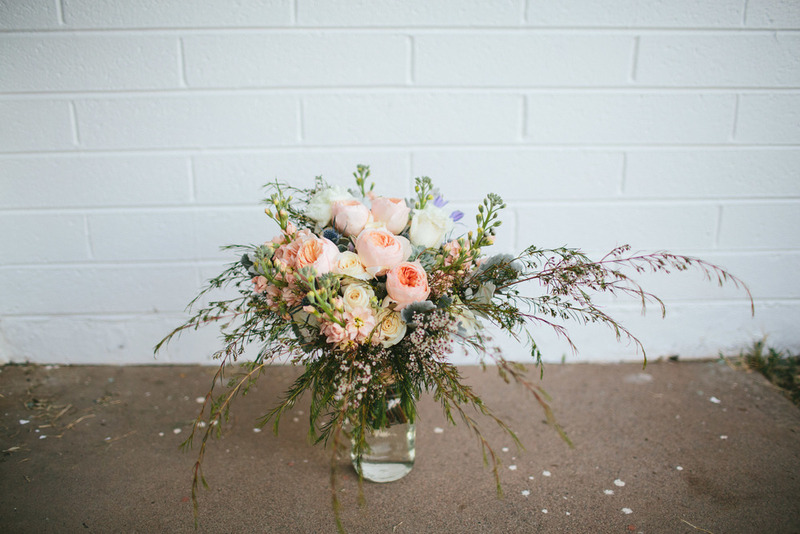 Their flowers were soft and romantic with Juliet Garden Roses, a few succulents, peach stock, and ranunculus. J and M’s wedding took place at a local desert park, in the heart of Phoenix. Their color palette was perfectly suited for the desert atmosphere. The photographers at Stoffer Photography came all the way out from Chicago and captured their day beautifully. You can see more of their beautiful wedding here. Their wedding celebrated the beauty of the outdoors. I surprised M with a flower crown that she wore during the ceremony. After the wedding they moved back to the Chicago area. I am looking forward to see where their creative movements take them! Last fall I met the cutest bride, she was so bubbly, bright and fun and best of all her name was Paris! 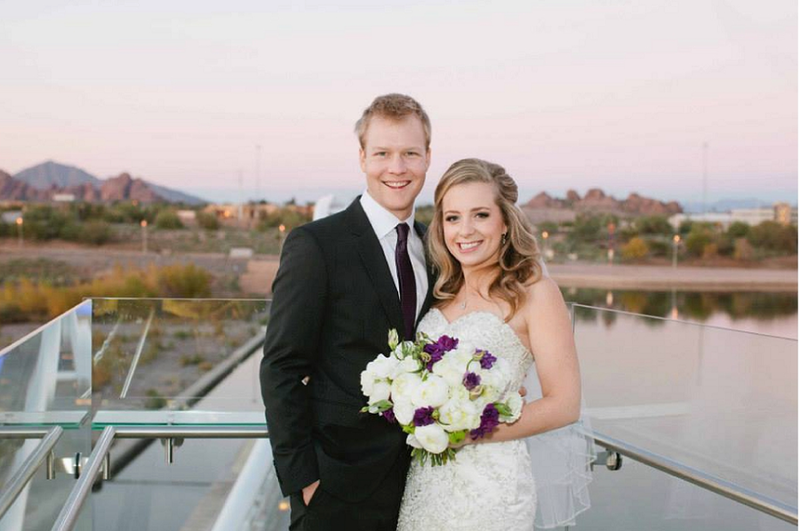 She and her love, Tyler, were married at the Tempe Center for the Arts the end of 2013. The venue was beautiful, sitting directly on Tempe Town Lake. The ceremony was outside on the wraparound deck overlooking the lake. The reception was inside, with floor to ceiling windows drawing in the incredible view. The bride was so pretty and her colors were on par with the feel of the venue (modern and fun). The bride’s bouquet was a mixture of peonies, ranunculus, stock, china mums, and purple lisianthus. The bridesmaids (all of them gorgeous!) carried a mixture of antique green hydrangeas, purple stock, pompoms, dianthus, and china mums. 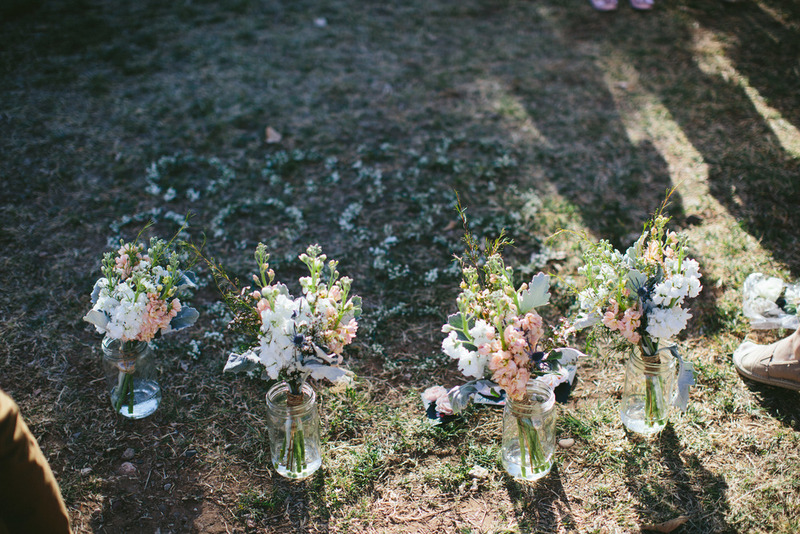 The wedding was photographed beautifully by Lexi Moody Photography, see more of her work here. Congratulations to such a lovely couple! So glad to have been part of your special day.